Savvy and budget-conscious cable subscribers already know the drill. Call your cable provider every 6-12 months, threaten to leave, and get a new and cheaper promo. Then, after the promo expires, pay the inflated “regular rate” until you get a chance to repeat. Comcast/Xfinity is notorious for forcing you to play this shell game. But what happens if you tire of it? How do you get a “real” price for your services and what do those prices look like? Xfinity’s upgrade center offers no clarity or transparency. They show you deals “tailored” to your location, never anything like an overview of choices. When you call their main line, a nice filipino man named Mike will start by asking you what you like to watch to see where you can “save.” But his training is to keep you playing the same shell game. Asking him to look only at prices after promotions expire does not compute. Getting better, clearer answers requires talking to the retention department, which you should ask for immediately. As the name of that department implies, their job is to do the best they can to keep you connected to their overpriced services. Unlike tier one representatives, they will actually reveal their secret regular pricing if you press them enough. But even then, it takes literally hours to get some real clarity. All prices are plus taxes and such, making it still unclear what the final price might be. However, any way you slice it, the cost is in the $120-$140/mo range for basic cable, a DVR, and HBO, and reasonably fast internet (with your own cable modem). The most revealing observation is that digital voice is effectively “free,” or put another way, it costs the same or more not to have phone service. This is because Comcast will charge you a $10 fee for made-up “HD service” when you do not get the Triple Pay package, which is the cost of digital voice. In addition, if you rent their DVR, they’ll charge you $2 more for that as well. So you can just as well ignore the “Double Play” section above. Opting for a 2-year contract will save you $10/month on either package. Or put another way, there’s a $10 surcharge not to be locked into the contract. The early termination fee starts at $230, and goes down by $10 per month of use. This means that if you terminate after 1 year, they will charge you $110. 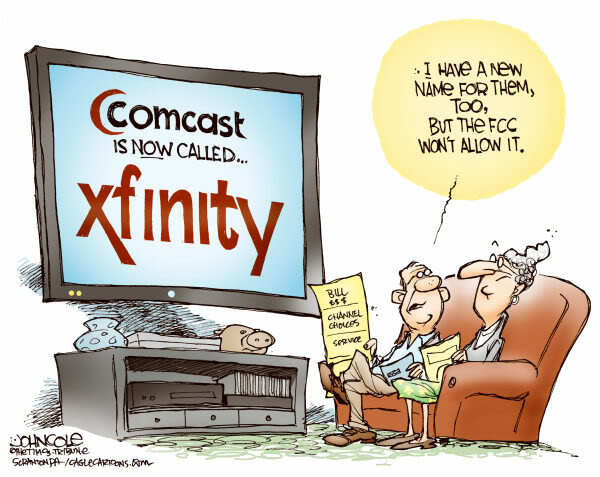 If you move, they will apply that charge even if Xfinity is unavailable in your area. However, you can move and keep Xfinity with your contract clock still running. Cable Modem and DVR: Rental or Purchase? I should note that the above prices do not include an extra $10/mo to rent their cable modem. Earlier this year, I decided to buy one instead, a wise choice if you plan to have cable internet any more than a year. Assuming you use their phone service you’ll need a telephony cable modem. The Arris TM822 is the one I bought for $133 on Amazon. When you get it, you will need to provision the modem with Comcast by giving them the device’s serial and IMEI numbers. In theory this should be a piece of cake, but agents may play dumb, so your results may vary. You will also need to return the old box to a service center, or use their UPS Store return service, one of the few services Comcast offers that is actually both helpful and free. After you do this, watch your cable bill like a hawk. If they’re still charging you for a “wifi gateway” or some such, you’re still paying to rent a cable modem you no longer have. This happened to me, and I was able to get a 6 month credit of $60 only with the usual additional hassle. The above prices do include $10/mo for renting a DVR. (So helpful that everything costs $10…) While you can buy your own DVR also, they do tend to go obsolete faster and it’s probably better to rent for that reason. The cloud-based X1 & X2 boxes are a good example. As of today, I’m still using an old hard-drive based DVR, but I plan to change that soon, as soon as I get through all those old recordings. Never mind, I’ll do it tomorrow. What about internet only for the cord cutters? If you want HBO, you can subscribe directly to HBO Now for $15+. So for cord cutters, 75MB internet + HBO costs about $85, with no DVR, no phone, no cable access. (Again, add another $10 if you have to rent a cable modem.) That would compare to $110 for Triple Play with basic cable, HBO, & 75MB internet on the contract, but without a DVR. So, looked at another way, for “just” $25 more, you can keep basic cable & phone service. The day after writing this, I went to my local Comcast “service” center to exchange my old DVR for the X1 box. It was noon. There were seven Comcast employees at or around six desks. At one desk, two were doubled up “working on an account” and another guy was just hanging out a few feet from a desk. Including myself, there were three other civilians there, and only two were being helped. So there were five employees not helping two customers for at least ten minutes. I wish I had taken a picture for this blog. When my number (yes, I was told to take a number even though when I walked in I was the only customer not being helped) was finally called, I said I wanted to swap my DVR and downgrade my service. The employee, the one who had been milling about before, snarked: “oh, that’s why you’re in such a hurry, you want to get home to watch your new X1.” Um, no, that’s not it. I had also requested an X2 box. He knew nothing of any X2, and asked if I had a phone to search for it on the web. I admit it’s not clear what X2 is, whether it’s a software platform or a different unit. But it was announced over two years ago. The kicker came when I told him what I expected to pay for digital starter, extreme internet, HBO, and the DVR without a contract: the $137 that the retention department had quoted the previous day. He, and then another employee who he called in to handle my outlandish request, denied any knowledge of any prices anywhere close to this. They pulled out a pamphlet and pointed to a poster showing the “regular” price for digital starter alone was $149. When I said that was the total price quoted by the retention department yesterday, they told me I had to talk to them. Pure Brazil. So I left without changing my service. When I got home, I contacted the retention department again, needing to first jump through the tier 1 hoop, as their voice prompt system doesn’t recognize “retention.” I was quickly able to get that original price, but to my dismay I was told it was not the regular price after all. It was another promotion. So the price will go up another $10/mo ($10 again!) during the second year of the promotion, and then who knows after that. But he kindly advised me to call in a year and “re-enroll” in the same promotion. So the shell game continues.